Researchers from the University of Texas at Austin, in collaboration with Aixtron developed a new method to grow high-quality wafer-scale (300 mm) graphene sheets. 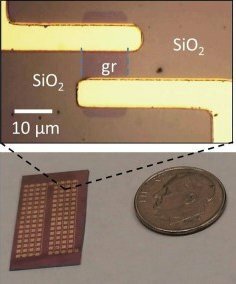 This process may enable the integration of graphene with Silicon CMOS and pave the way towards graphene-based electronics. The method is based on CVD growth on polycrystalline copper film coated silicon substrates. They report that their graphene has better charge carrier transport characteristics compared to previously synthesized poly- or single-crystalline wafers. The graphene has few defects and covers over 96% of the 300-mm wafer substrate. In July 2014, Graphene Frontier launched the "six sensors" brand for highly-sensitive chemical and biological GFET-based sensors following a financing round of $1.6 million. Graphene Frontiers announced a partnership with the Colleges of Nanoscale Science and Engineering (CNSE) at SUNY Polytechnic Institute (SUNY Poly) to develop next generation graphene-based processes, technologies, and techniques. As part of the partnership, Graphene Frontiers and the CNSE will build a 300 mm fabrication process and wafer-transfer facility. The total investment in this project will reach $5 million over 3 years (and will be funded by the CNSE and Graphene Frontiers) and the project will employ 27 employees. Researchers from the University of Pennsylvania demonstrated a graphene-based mutli-modal bio-sensor that can transmit transducing protein binding events into optical, electrical, and mechanical signals. Such a multi-modal sensor means that you can inspect a single sample and obtain information from the three properties (optical, electrical and mechanical). This could lead to a sensor that outperforms single-mode sensors even if each signal detection by itself is not the best one. The researchers say that their sensor achieves a 100-times improvement in the sensing dynamic range over current single-mode sensors. Two weeks ago, Graphene Frontier announced that they raised $1.6 million, which will be used to expand operations and accelerate the development of their proprietary GFET sensors and manufacturing process. Graphene Frontiers launched the "six sensors" brand for highly-sensitive chemical and biological GFET-based sensors that can be used to diagnose diseases with multiple markers such as cancers and illnesses currently diagnosed using ELISA technologies. I asked the company to explain a little more on this interesting new sensor platform. 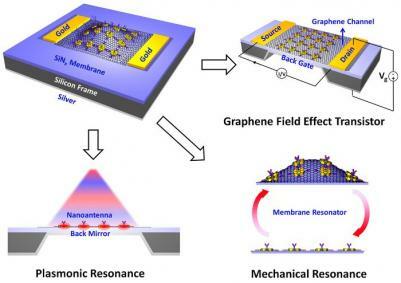 It turns out that the sensor is based on a functionalized graphene field effect transistor (GFET). The unique properties of graphene enable detection of molecules in femtomolar (fM) concentrations - this is vastly better than any other sensor on the market. Graphene Frontier, spun off from the University of Pennsylvania, is producing graphene using their own Atmospheric Pressure CVD (APCVD) technology, a roll-to-roll process that does not require a vacuum. We now hear that the company raised $1.6 million in Series Seed B funding. The round was led by Trimaran Capital Partners with participation from R2M Investments and return backers WEMBA 36 Angels. Graphene Frontiers will use the money to hire additional researchers, expand the lab facilities and accelerate the development of their proprietary GFET sensors and manufacturing process.